Will Sanction Relief Improve Living Conditions in Sudan? 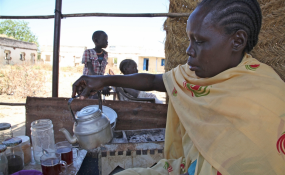 Tea seller Achuil Deng now only sells a few cups a day oustide an abandoned Abyei school. Khartoum — Sudan on Saturday said the end of the economic embargo will help it reintegrate in the international trade and financial markets. The Minister for Trade, Hatim Al Sir, has stressed that the decision to repeal the American economic sanctions will help boost anew Sudan's trade with the USA and would lead to an overture in the trade relations with the United States and with the European union and would open the way for the return of the Sudan and its inclusion in the international financial and trade system. The sanctions have led to closure of many a western market in face of the Sudan and in face of the Sudanese exports, the minister told the Sudan News Agency on Saturday, adding that repealing the sanction would help the Sudan permeate into the European and American market and open up new markets for the Sudanese exports. He argued that Sudan exports to European and American market which used to take 65% of Sudan export in 1996, have dwindled to 4% this year, a matter that led to huge losses in Sudan's foreign trade. He said the sanctions have also frustrated Sudan's effort to join the World Trade organization WTO. But he stressed Sudan which has met all preconditions for the membership will make use of this development to join the world organization. He said the Sudan would work earnestly to promote its exports to the United States, EU and north and South America markets. Copyright © 2017 Sudan News Agency. All rights reserved. Distributed by AllAfrica Global Media (allAfrica.com). To contact the copyright holder directly for corrections — or for permission to republish or make other authorized use of this material, click here.